Howard Tayler is the creator of the wildly popular web comic Schlock Mercenary. He’s been updating his comic for 5,663 days in a row. He’s also part of an award winning podcast called Writing Excuses. He’s currently working on a role playing game called Planet Mercenary, due out early next year. He finds time to publish a yearly rank of movie reviews at his personal website, HowardTayler.com. I caught up with the incredibly busy artist and author earlier this month for an email interview. [Rodney M Bliss] You’ve had multiple careers, music producer, software geek and now cartoonist. Is this the last one? Do you see yourself working in and around Schlock Mercenary until you retire? [RMB] You’ve talked about the story of Schlock Mercenary ending. As I remember it, you said, “And then when the books come out, those of you who like to collect all of something will have your chance.” When do you plan on wrapping up the current set of books? And what comes next? Will you stay in the Schlock universe? Will you try to do more with stories? [HT] See? THIS question really sticks it to me. The current story online, “Big Dumb Objects,” is probably the penultimate or pre-penultimate volume, depending on how far into the weeds I decide to wander. The tricky part of this job is pulling threads together in a manner that is at once satisfying, surprising-yet-inevitable, and paced for maximum impact. Some of these threads have been spooling out for fifteen years, and I did NOT think I was writing a multi-volume epic space opera when I started spooling those threads out. Fortunately, I’ve gotten a lot better at this job. It’s worth noting that ever since 2003 I’ve worked hard to create satisfying beginnings, middles, and ends that can be wrapped in covers and stamped upon the pulped, pressed flesh of dead trees. At first this felt like a commercial compromise, but I quickly realized that it drove tighter story-telling. I’ve done it a dozen times now, and have a really good feel for how to execute on a story of that size. Unfortunately I have NOT yet wrapped an end around a sesquidecadent (does that mean 15 years, or does it mean one-and-a-half unprincipled depravities?) epic, so despite all the planning I’m doing, ending Schlock Mercenary is something I don’t get to practice. I have one chance to get it right. If we assume, for the sake of numbering things, that Schlock Mercenary: Big Dumb Objects will be followed by two more Schlock Mercenary volumes, this chance I have to get it right will fall on Book 18, which will probably happen sometime in 2018 or 2019. What comes next? The current plan (subject to change) is pretty simple: We’ll fast-forward to a point where it makes sense to not be following this same group of characters around. The ones who survive Book 18 will be given ample time to retire, die of old age, disappear mysteriously and become legends, or perhaps all three. Schlock will still be there, of course, but these stories will not require any knowledge of what was in the previous eighteen-or-so books. That’s what comes next for schlockmercenary.com. There are plenty of other things that will also come next. Expect more prose from me, for starters. The Planet Mercenary RPG is also a business that will be getting lots of attention. [RMB] You’ve been very public with your struggles with mental health, especially depression. How much of that was therapy and how much was an attempt to make it safe to talk about? Have you heard from people who felt better able to deal with their own mental health issues because of your example? [HT] First: if those reading my answers have not yet read “No. I’m Fine.” I would like them to. It gives this discussion some context. For me, naming my demons and describing them in ways that allow others to recognize them was definitely therapeutic, but it was not prescribed. You can call it therapy, but it’s not like it’s part of a twelve-step something-or-other in my case. I have heard from a great many people who have been helped by the stuff I’ve written on the subject. I’ve also been helped by their feedback. Sure, there have been some (well-meaning) hamfisted jackwagons in the bunch, but putting up with them isn’t all that hard (OBJECT LESSON: “naming my demons and describing them in ways that allow others to recognize them” is a multi-function tool which I used in this sentence.) It’s very gratifying to know that I’m helping people. Mental health issues are still stigmatized here in the U.S., and in a great many parts of the world. If we talk about them we begin to understand them, and if we truly understand them we may be able to find root causes which can be treated in ways that make us all happier, better people. [RMB] You are a very accessible celebrity. But, the public often has an insatiable thirst. How do you balance providing access for your fans and still maintaining a personal life? Are there times where you get tired of being “on”? [HT] If I seem like an “accessible celebrity” then I’ve successfully created a believable fiction that serves my purposes nicely. Obviously the cork comes off the bottle eventually. I recall one such instance in which I was out at a post-convention dinner with close friends. I was definitely “off.” I told them as much, and they understood. Unfortunately, we ran into some other friends, and apparently my friends did not understand just how “off” I really was. 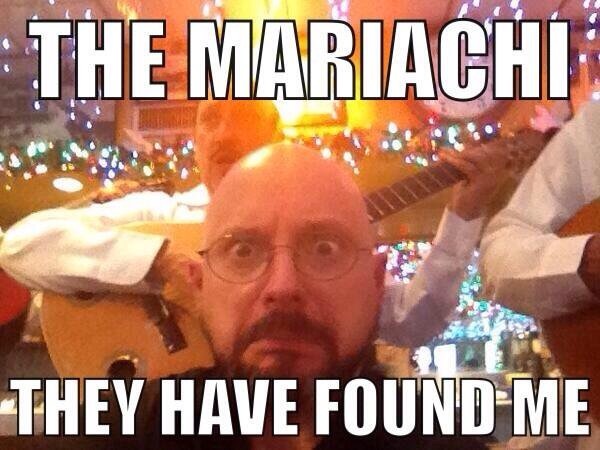 I ended up sitting at the head of a table of 20 people in a very noisy Mexican restaurant. Several people asked whether I was okay. Some wondered if I was angry at them. I had to explain that I was no longer “on,” and was simply here to fill a caloric need. It was embarrassing, and I was concerned that I might be upsetting people just by virtue of not being able to smile and talk. In an effort to “cheer me up,” someone who shall remain nameless gave money to three nice men with guitars. They stood behind and around me and began performing in full Dolby 666 Beelzurround. I took inventory (a cognitive behavioral therapy technique that in this case was essentially counting how many nerves I had left) and realized that I could either rage-quit dinner, or take a selfie. [RMB] What was the most surprising thing about working for yourself? Did anything catch you off guard, as in you weren’t expecting it? I work longer, and harder here than I ever have anywhere else. Nobody has fired me yet. Imposter Syndrome never really goes away. I picked this job out of a love for it, but sometimes I don’t want to work. Sometimes I have to go to work even when I don’t want to. There are a great many things that other self-employed creatives have found surprising, but which I was well-prepared for. I have a sound understanding of basic principles of business management, time management, and marketing, which skills I acquired across eleven years in technical and managerial fields. The list of surprises in those categories is long, and some of them are pointy. A couple of the pointy ones have toxic substances on the pointy-bits. [RMB] What’s a decision that you would go back and do differently with the benefit of hindsight? I would have experimented with brush pens in 2005 instead of waiting until 2014. Back in 1994, when I first had the idea to do a science fiction web comic, I would have dismissed as absurd the notion that I needed someone else to do the artwork, and begun learning to draw. I wouldn’t have invested in real-estate in 2006. [RMB] What is the coolest part of your job? When I worked at Novell, I often climbed into bed dreading the next day’s activities. Instead of thinking about work, I spun fantastic stories in my head in the hope that for the next eight hours I’d be relaxed and happy (if unconscious.) Usually it didn’t work. Sometimes I had insomnia. These days, I climb into bed and begin spinning fantastic stories in my head as I drift off to sleep in the hope that I’ll have insomnia, and I will get to leap from bed and go to work early. I do not hate Mondays, and I am horrified at the thought that millions of people actually do. [RMB] You’ve published fan art in the past. Do you ever intend to expand this and encourage or solicit fan fic? [HT] I’m going to give the fan-art/fan-fic valuation discussion a wide miss (tl;dr (too long; didn’t read)—both are extremely valuable and useful to the person creating it) and cut straight to the chase: If I’m soliciting artwork or fiction, it’s not “fan-” anything. I’m hiring a professional to create an image or tell a story in my setting, and to my specifications. I’m already doing exactly that with the Planet Mercenary RPG. Incidentally, the people who play the Planet Mercenary RPG will be engaged in cooperative storytelling in “my” universe, and the moment they do that they’re creating fan-fic. It’s my hope that they’ll find this both entertaining and fulfilling, and I look forward to the day when I begin receiving mission-briefing style PM-RPG reports from players. [RMB] Let me ask it a different way. Do you ever expect to have a method for fans to create fan-art/fan-fic in a way that it can be shared with other people? Something like a collaborative writing area? [HT] I don’t have any plans to do anything like that. What I might do someday is reach out to a professional writer or cartoonist and hand them one of the smaller stories that make up the backstory of some of the characters. And then have that artist create the self contained story. But there are no immediate plans for that. This is the first of a five part series on Schlock Mercenary.